^ Squier, Christopher A.; Kremer, Mary J. (2001). 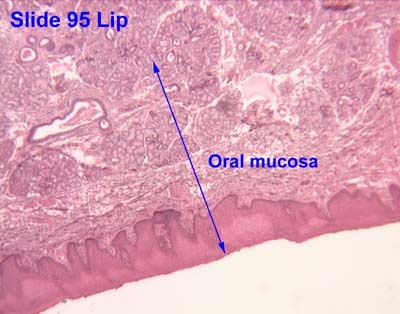 “Biology of Oral Mucosa and Esophagus”. Journal of the National Cancer Institute. Monographs (29): 7-15. PMID 11694559. http://jncimono.oxfordjournals.org/cgi/pmidlookup?view=long&pmid=11694559. ^ Chandra (1 January 2004). 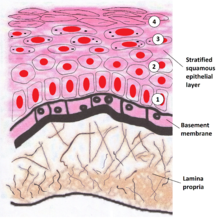 Textbook of Dental and Oral Histology and Embryology with MCQs. Jaypee Brothers Publishers. pp. 180-. ISBN 978-81-8061-238-1. https://books.google.com/books?id=BUNyjNVu5wcC&pg=PA180. 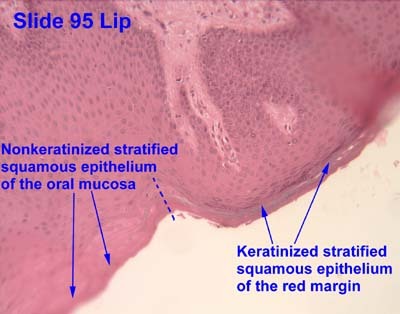 Histology image: 09601loa — Histology Learning System at Boston University - "Digestive System: Oral Cavity and Teeth - lip, oral mucosa"
Histology image: 95_04 at the University of Oklahoma Health Sciences Center - "Lip"
Histology image: 95_07 at the University of Oklahoma Health Sciences Center - "Lip"